Mediassociates of Newtown was honored with a Celebrate CT award from the Connecticut Economic Development Association for the company’s contribution to the economic growth of the state. Scott Brunjes, the founder and president of Mediassociates, a media planning and buying agency, said the award is a confirmation of his company’s investment in Connecticut. CEDAS is a not-for-profit organization committed to advancing the practice of economic development in Connecticut. The association provides its members a forum for discussion and the exchange of information. Mediassociates was nominated for the award by the Newtown Economic Development Commission and Western Connecticut State University. 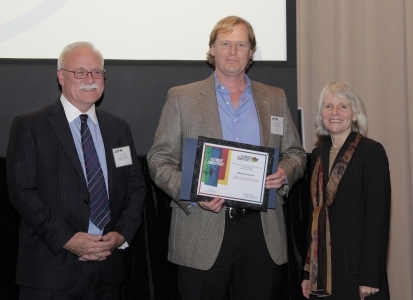 The company was recognized at the CEDAS annual ceremony at the Bushnell Performing Arts Center in Hartford. Mediassociates has seen an average growth rate of 30 percent a year over the past 10-plus years and was highlighted as one of the top 3,000 fastest-growing privately owned businesses in America by Inc. magazine. Founder and CEO Scott Brunjes maintains his relationship with Western Connecticut State University with a marketing scholarship program and has hired many of his employees from the university. Helping Connecticut’s youth graduate from college and then retaining them in the state has made a significant impact on Connecticut’s economy. Brunjes founded the company in Danbury in 1996 and moved it to the Sandy Hook neighborhood of Newtown in 2013. Among the company’s dozens of clients are the Centers for Disease Control, Southern New Hampshire University, Gulfstream, Guess Watches, Black and Decker, Gaylord Hotels, Save the Children, and Genesis Healthcare. Mediassociates guides clients to better advertising campaign results. We partner with internal marketing teams or other external agencies, and focus solely on planning, buying and measuring advertising such as TV, radio, print, digital, social and mobile for improved performance.